Canola oil works well with stir fries because of its high heat tolerance. Get cooking! See the recipe video below. 1. Place pork strips on dinner plate, spoon 1 Tbsp (15 mL) soy sauce over all and toss to coat well. Let stand 15 minutes in refrigerator. 2. Meanwhile, heat large nonstick skillet over medium-high heat. Add nuts and cook 2-3 minutes or until they begin to brown, stirring frequently. Place on separate plate and set aside. 3. In microwave-safe shallow pan, such as glass pie pan, place carrots, broccoli, onion and water, then cover and microwave on high power 2 minutes or until vegetables are just tender crisp. Drain in colander, shaking off any excess liquid. 4. In small bowl, combine sauce ingredients and set aside. In large nonstick skillet, heat 1 tsp (5 mL) canola oil over medium-high heat. Tilt skillet to coat lightly, add pork and cook 3 minutes or until lightly pink in center and juices run clear, using two utensils to toss easily. Set aside on separate plate. 5. Heat remaining 1 Tbsp canola oil, add vegetables and cook 4 minutes or until tender crisp and beginning to lightly brown on edges. Place vegetables on serving platter. Add pork and any accumulated juices to skillet, cook 30 seconds to heat thoroughly, and place on top of vegetables on serving platter. Add sauce to skillet and cook 20 to 30 seconds to heat, stirring constantly, until reduced slightly. Spoon over pork and sprinkle with nuts. Serve immediately for peak flavors and texture. Tips: Stir-fries cook quickly, so it's critical to have everything prepped before starting to cook. 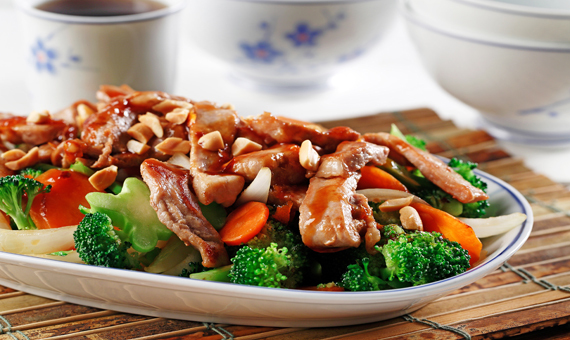 Hoisin sauce is found in the Asian section of major supermarkets. Lettuce wraps are perfect for get-togethers; guests serve themselves, filling lettuce leaves with pork mixture and garnishes to wrap and eat. No knife and fork required! Here, canola oil’s high heat tolerance is ideal for sautéing and its neutral taste lets aromatics such as garlic and ginger bloom. A twist on the popular Southern barbecue dish, this “pulled pork” is infused with rich, exotic Asian flavors, plus hints of chili and orange. Canola oil’s mild taste helps those flavors sparkle. 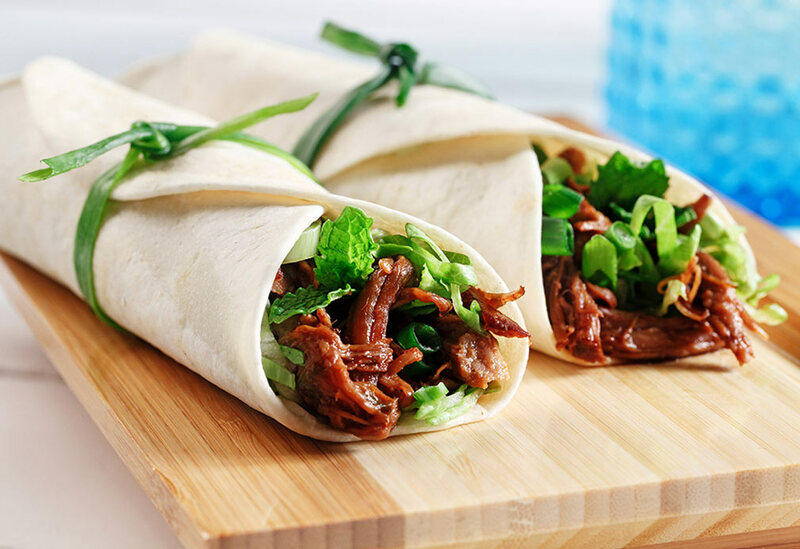 The meat is wrapped in tortillas and garnished with shredded lettuce, cilantro or mint sprigs, green onions and a dash of sour cream for a sensational meal.